In script editor, click the Date/Time icon on the component toolbar. To configure the date input component to prompt for a date, time of day, and time zone for the callback, expand the Common group. Then set Includes Time to Yes. To store the agent’s date and time selection, expand the Common group. Then select a string variable from the Value list. If necessary, create a new variable. Your results should be similar to the example below. Click Button to add a submit button for the agent to click after entering the date and time. With the button selected, expand the Common group. Change the Text property to Schedule Callback. 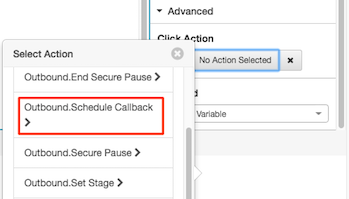 You may think that a Schedule Callback button is unnecessary, since you can assign an Outbound.Schedule Callback action to a date input component. That practice is not recommended, since the date input control invokes its action every time its bound variable is updated. That happens whenever the agent changes a date, time, or time zone setting. To prevent multiple schedule requests, and to allow your agents time to review schedule settings before committing callback requests, use a button action instead.